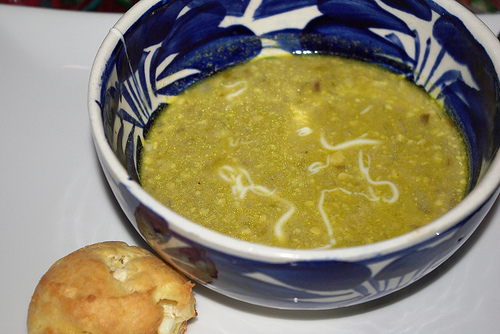 A lovely, silky soup that can be served hot, cold, or at room temperature. A hint of citrus at the end of cooking brightens the taste. We used lime and substituted Meyer lemon juice, with its orange sweetness, for orange juice, adjusting the amount to taste. Finely grind pistachios in food processor. Heat the olive oil in a heavy saucepan. Add the shallot, leek and the garlic. Sauté until translucent. Add the rice flour, stirring constantly. Add the broth and bring to a boil. Add the ground pistachios, salt and pepper. Reduce heat. Cover and simmer for 45 minutes, stirring occasionally. Add the orange and lime/lemon juices, stir. Taste and adjust seasonings if needed. Garnish with a swirl of yogurt or chopped pistachios. Can be served hot or cold. *Rice flour can be found in many specialty and natural food stores.